This month’s We Heart is a little different than normal. We recently moved offices and had a green wall installed in our entryway. We absolutely love the way it adds life and color to our office from the moment you walk in the door. So for this month's We Heart, we wanted to talk about why having plants in your home or office is so beneficial (to your health as well as your skin!) 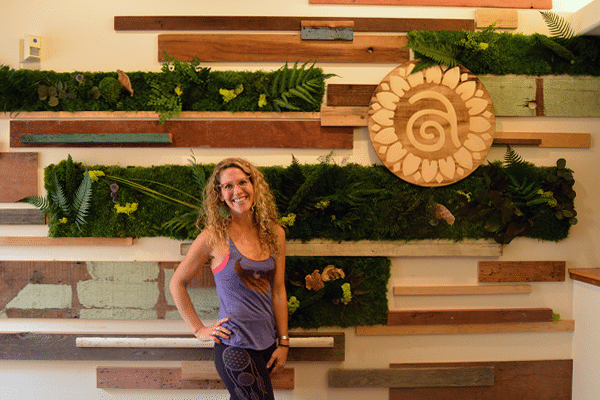 and tell you about the amazing woman who designed our wall installation. Having plants inside the house is not a new concept by any means. But there are some really inspiring designers out there right now who are figuring out new ways to incorporate plants into building and interior design, taking advantage of generally unused vertical space. Their innovations are allowing us to experience more greenery in our daily lives, the benefits of which are partially obvious but might be even better than you think. This term can mean a few things. Is a house with ivy growing up the side of it a green wall? Sure, but by some definitions, this is classified as a green facade. 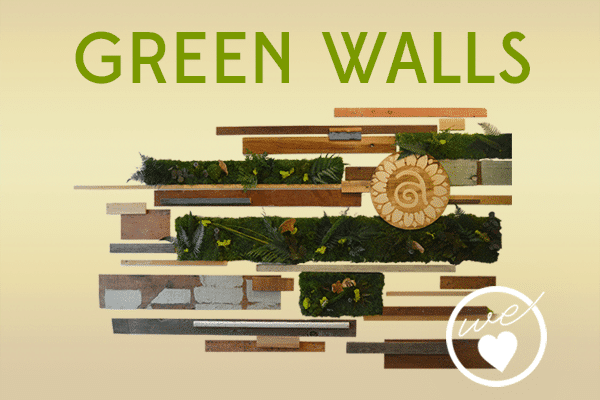 What typically distinguishes a green wall is that plants are not anchored to the soil below. Generally, there isn’t soil involved at all. Rather, plants are affixed to a medium—fabric, concrete, sometimes plastic—and grow straight out of that. This is where the technology aspect comes in. Plants on green walls are sometimes watered using graywater systems, recycling some of the water that's already been used in the building. Designers may arrange plants so that those with the highest water needs are at the bottom. In some cases, plants don't need to be watered at all. Semantics aside, there are some really cool things happening right now. 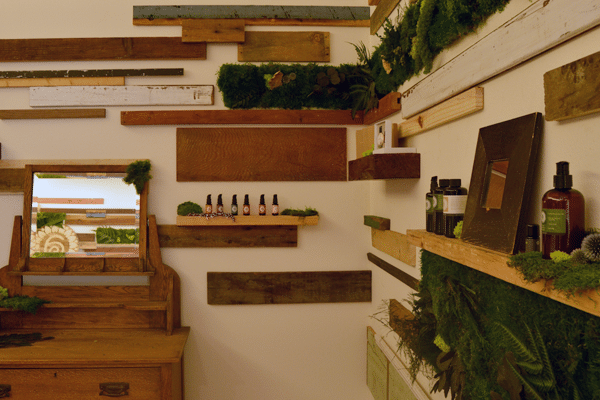 People are finding ways to use their vertical space to incorporate more plants into their homes and offices. There are some awesome benefits that come with this. We know that plants are good for us. But have you thought about how much you’re truly affected by having plants around you? A study done in 2008 looked at how surgery patients were affected by having plants, including flowering plants, in their hospital rooms, compared to patients with plantless rooms. What they found was pretty conclusive—after surgery, patients with plants in their rooms needed fewer painkillers, had lower blood pressure and heart rate, and gave lower ratings of pain, anxiety, and fatigue. And they reported that they liked their rooms more (obviously). We know there are a lot of benefits to going outside, and some of these benefits come purely from seeing greenery. By incorporating more plants into our spaces, we are reaping serious physical and psychological benefits, regardless of whether we’re recovering from injury or illness. Many of us worry about outdoor air pollutants from cars, industry, and other sources. And that’s a valid concern. But did you know that indoor air pollution is often worse? And in addition to increasing the risk of respiratory illnesses, heart disease, learning disabilities, and even cancer, pollution can accelerate the appearance of aging. Luckily, plants help filter out air and keep it cleaner. Some plants are particularly good at this. And with green walls, you’re able to include a dense and diverse array of plants, which means even more air filtration (compared to having a few potted plants around). Plants also attract dust, so having them inside can reduce particulate levels. Ever notice how it’s cooler in a forest, or even when you’re next to one big tree? Part of that is shade, but it’s also due in part to transpiration, the plant version of sweating. Through their transpiration process, plants add water to the air, acting as natural humidifiers. This is a great bonus, because dry air can leave our skin irritated, dull, and flaky. We’ve been talking about benefit as they relate to interior green walls , but there are many reasons for installing a green wall on a building’s exterior as well. Outdoor green walls also provide temperature control. The effect that a large-scale green wall installation can have on the building it adorns is pretty fantastic. They have a significant cooling effect, thereby decreasing the need for air conditioning. These installations also protect the walls they cover from sun damage, which has an effect on a building over time. As with any project, there are considerations for the space you’re working with and what you’re looking to get out of it. For us, our space was the entryway to our office, which receives some light but not necessarily enough to keep a wall of plants happy. We also aren’t equipped to install an entire greywater irrigation system to water them. And with our state in a state of drought, we weren't about to spend clean water on this. So we were really excited to connect with our friend Amanda, who is using a patented plant preservation method to create green designs that don’t require water or light. The plants stay green and vibrant-looking, but don’t require any inputs. So what you get is evergreen art. She arranged these planks of moss, ferns, and other plants (there’s even a mushroom in there) amongst reclaimed wood pieces from a nearby salvage yard to create something super unique and beautiful for our space. Russel, a woodworking wizard, helped her with the installation. 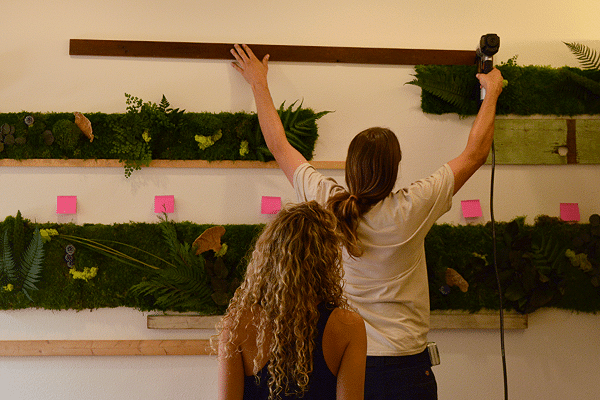 Amanda incorporated shelves into the design, since this will soon be our new retail space! 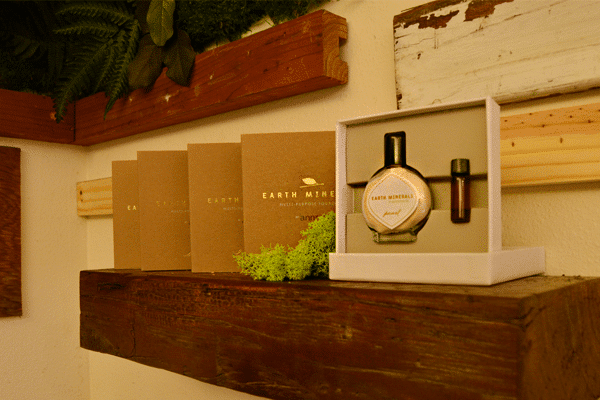 You'll be able to come visit us in Berkeley and purchase or test out any of the products in our line! Stay tuned to find out when our grand opening is. Amanda's visions for creating custom, inspired, sustainable pieces comes from her education and experience in regenerative design. Her masters degree focused on using plants to enhance the performance of buildings by improving indoor air quality. Amanda's LEED accreditation and background in permaculture also guide her designs. Her diverse background includes working with a nonprofit that focuses on innovative and sustainble product design and redesigning a barren warehouse into a vibrant and evironmentally friendly music venue. 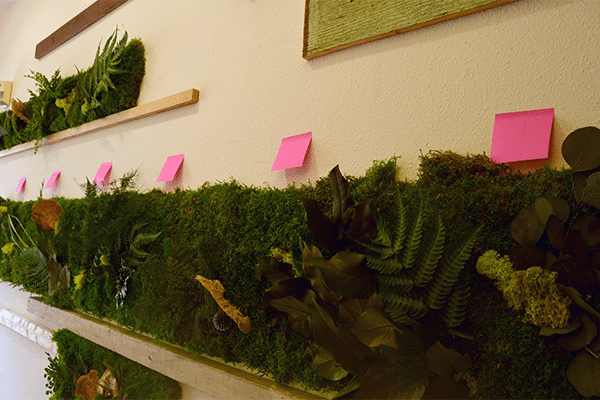 Her company, Planted Design, focuses on green walls, both living walls and the moss wall style that she did for our office. Her unique approach to design is something we haven't seen before. Working with her was such a fun process. Rachel got to go with her to choose the wood pieces you see in this photo and collaborated with her to incorporate shelves for product display into the design. During the couple of days she was in the office installing this, she stopped to have lunch with the team and answered our questions about everything from the types of plants she uses to her career path to which offices and locations she's installed her beautiful designs. We're a curious bunch. Every month, we write about something we LOVE. Usually it's a specific product, but as this month's piece exemplifies, it's not always. What we look for are things that inspire us—supplements that can change your health game, chocolates worth writing home about… We even recommend other skin care brands sometimes. I can’t seem to find the address of your retail store….I have been a fan from back in your early blogging days and have most of your products…now would love to visit you in your new location….where is it!